Birds In Danger: Could $15 Stamp Help? If you’ve ever hunted waterfowl in the United States, you were legally required to purchase a Migratory Bird Hunting and Conservation Stamp, known broadly as a Federal Duck Stamp. They raise a LOT of money for waterfowl. A group of conservation-minded hunters has now proposed a similar stamp for upland game birds, some of which have seen precipitous population drops in recent years due largely to habitat destruction. “Upland birds are among the fastest and most consistently declining bird populations in North America and grassland and prairie habitats are the fastest disappearing habitats in the US,” reports Ultimate Upland, the group behind a petition drive to institute an upland game stamp. Upland game birds have become a political lightning rod. The Gunnison sage grouse was listed as a threatened species last year, an act that polarized those with interests in both land and conservation in Colorado and Utah. So was the lesser prairie-chicken. 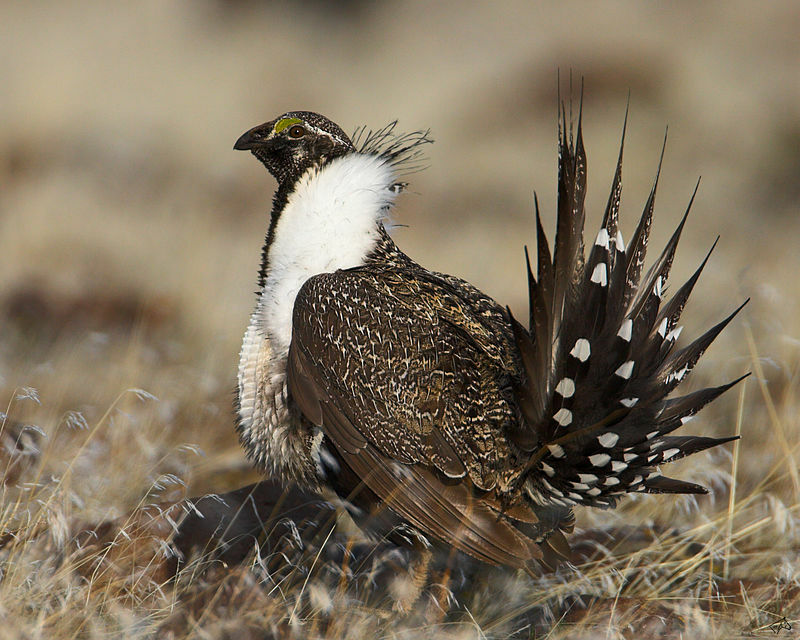 The greater sage grouse, greater prairie-chicken, sooty grouse, and northern bobwhite have experienced dramatic decline in the last 40 years. Scaled Quail and Sharp-tailed Grouse are also showing steep declines with loss of habitat being the primary cause. Unlike waterfowl, whose breeding and migration areas are protected through the Duck Stamp supported Migratory Bird Conservation Fund, upland game birds rely largely on Conservation Reserve Program lands that are leased from farmers or other land owners for their habitat. Those lands may soon dwindle. The Agricultural Act of 2014 reauthorized the CRP program, but reduced the enrollment cap from 32 million acres to 24 million acres by FY2018. While that is only a cap, and the program has rarely reached 100 percent enrollment, the Department of Agriculture, which oversees the CRP program, optimizes it for the protection of cropland from erosion, not the maintenance of healthy bird populations, which is a side benefit. If a similar program to Duck Stamps were instituted for upland birds, how would it work? The history of the Duck Stamp is instructional. Duck Stamps raise funds for wetland conservation, with 98% of the proceeds of each stamp sold going to the Migratory Bird Conservation Fund. The Duck Stamp program has been widely lauded as a successful conservation measure of the American sportsman. More than 3.5 million acres have been conserved as National Wildlife Refuge or Waterfowl Production Areas during the past 50 years, with more than half of the needed $400 million coming from $256 million in Duck Stamp receipts. The proposed Federal Upland Stamp could be a similar measure, instituting a nationwide stamp requirement for the hunting of upland birds. It could raise funds for the improvement and protection of habitat and educational initiatives. Would it be popular with hunters? That’s a tough question, as hunters already bear a large burden of taxes on ammunition and equipment through the Pittman-Robertson Excise Tax for the sake of environmental protection. Many hunters are also skeptical that federal program dollars will not find their way to the intended purpose and may favor a state level or private sector approach to land preservation. Yet if they see the fruits of their dollars as quality public upland game land and thriving populations of upland birds, it could garner support. Hunters have long been staunch advocates of land conservation (just look at Ducks Unlimited as a private example) and many would likely get onboard if they could be assured the dollars went directly to conservation and not bureaucracy. It’s an interesting idea that deserves some thought and investigation. If you are passionate about upland game birds, visit the petition site to learn more. And while this solution to upland game habitat loss is just one of many possible eventualities, it is certainly one worth discussing.